This volume--a collection and synthesis of key research studies since the program's inception over three decades ago--serves as a marker of the significant role that Sesame Street plays in the education and socialization of young children. Editors Shalom M. Fisch and Rosemarie T. Truglio have included contributions from both academics and researchers directly associated with Sesame Street, creatin… g a resource that describes the processes by which educational content and research are integrated into production, reviews major studies on the impact of Sesame Street on children, and examines the extension of Sesame Street into other cultures and media. In the course of this discussion, the volume also explores broader topics, including methodological issues in conducting media-based research with young children, the longitudinal impact of preschoolers' viewing of educational versus non-educational television, and crosscultural differences in the treatment of educational content. 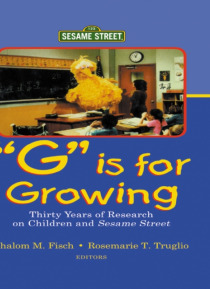 As the first substantive book on Sesame Street research in more than two decades, "e;G"e; is for Growing provides insight into the research process that has informed the development of the program and offers valuable guidelines for the integration of research into future educational endeavors. Intended for readers in media studies, children and the media, developmental studies, and education, this work is an exceptional chronicle of the growth and processes behind what is arguably the most influential program in children's educational television.